The Vitamix juicer is considered to be one of the most powerful juicers around the world. Making green juice with a Vitamix juicer is easy and fun. The green juice is not only easy to make, but it is delicious and nutritious as well. Starting the process is very simple. Juicing can be a lot of fun. Um! wait a minute, the juice that we are going to show is made with a Vitamix blender or any other blender, but we can turn it into juice with a small twist. Just read on and you will find out how. First of all you have to choose some of your favorite veggies. You must keep in mind that some of the vegetables give you bitter or sour types of juice, whereas others give you sweet juice. Therefore, choose accordingly. Here we are going to discuss making a celery based juice. Celery helps reduce blood pressure levels, and is also an effective defense against cancer. There is a substantial quantity of vitamin A, B, and C available in celery. You can also combine it with cucumber, the two together will taste amazing! First, wash all items carefully. Next, place them in your Vitamix juicer. 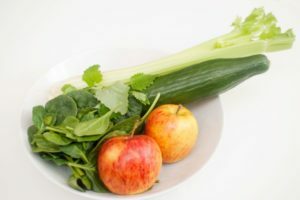 You need to cut items like celery, carrots, and cucumber, and apple into pieces in order to put them in the juicer with the other items. Add the lemon juice, and 1 cup of fresh water. The above recipe will makes several batches so you should have plenty! Ideally, you should be able to take one third of the ingredients above to make each green juice batch. That means you can complete the whole process in 3 batches. After adding the one third quantity of the ingredients to your mixer, you have to blend these items until they become smooth. keep adding more of the juice ingredients till you turn everything into a smooth mix. Now you need a pair of tights, and scissors. the tights will act as a strainer to capture the pulp. Cut 12 inches off the pair of tights and tie a knot at one end. Now transfer the green mixture from your Vitamix juicer into the tights. Ideally, you should add 2 cups of the mixture at once, and use your hands to squeeze the green juice. You have to leave the pulp in the tights. Repeat that process until all of the juice mixture is in your glass. It is good to drink the fresh juice immediately, however, if you want to store this delicious, healthy juice, you can store it for up to two days in your fridge. Your Vitamix juicer gives you the best green juice to drink. You will not be disappointed!